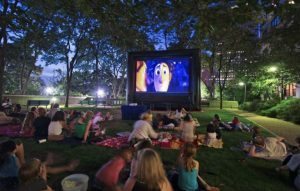 Lots of free movies will be shown outside this summer all around MetroWest and Greater Boston. Movies usually begin at sundown. If the weather is “iffy”, it’s good to check for cancellations before you go. This entry was posted in Listening, Local Information. Bookmark the permalink.